In 1754, during the French and Indian War, Benjamin Franklin presented his Plan of the Union to seven colonies at a meeting in Albany, New York. He acknowledged the Iroquois League, its national structure then explained his proposal. His Plan rejected, the Articles of Confederation followed in 1781. “It would be a strange thing if Six Nations of ignorant savages should be capable of forming a scheme for such an union, and be able to execute it in such a manner as that it has subsisted ages and appears indissoluble; and yet that a like union should be impracticable for ten or a dozen English colonies,” Franklin a member of the Pennsylvania Assembly wrote in 1751. The Iroquois League included six nations or tribes: the Cayuga, Mohawk, Oneida, Onondaga, Seneca, and Tuscarora. 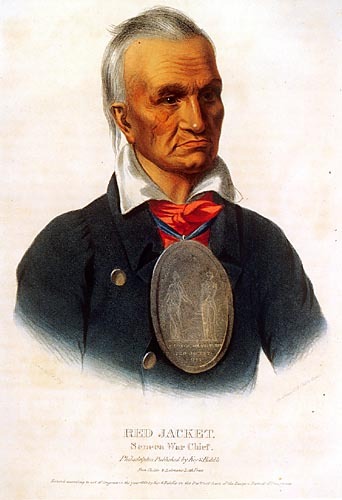 Seneca Chief Otetiani was born in 1758. A British ally during the Revolutionary War Otetiani was also known as Red Jacket. In the 1770s the British employed him as a messenger. Red Jacket who could not read, write or speak English became famous not only for his oratory—the Seneca renamed him Sagoyewatha—but also his opposition to Christianity and religious conversion. “In managing the affairs of the Indian tribes, generally…in introducing among them some of the primary principles of civilization…it appears proper to teach them to expect annual presents conditioned on the evidence of their attachment to the interests of the United States,” President Washington told the U.S. Senate. Red Jacket’s Six Nations received cash. He was given a large silver peace medal, the first known keepsake of its kind. The son of Cornplanter, a young chief about 25 years of age, was “among the 50 Sachem and Warriors” who arrived in Philadelphia. “When the Marquis de LaFayette went to France, he took this young chief with him, gave him a fine education, and two years ago he returned an accomplished Frenchman,” Rev. Manasseh Cutler wrote while in Philadelphia. Red Jacket, who met LaFayette for the first time in 1825, criticized the conversion. “Brothers, I have not come for your lands or your money, but to enlighten your minds, and to instruct you how to worship the Great Spirit agreeably to his mind and will and to preach to you the gospel of his son Jesus Christ. There is but one true religion, and but one way to serve God, and if you do not embrace the right way, you cannot be happy hereafter…To endeavor …open your eyes, so that you might see clearly, is my business with you.” Evangelicalism, a term taken from the Greek word euangelion, means the good news or gospel. Jefferson wrote the Virginia Act for Establishing Religious Freedom in 1786. President Jefferson acknowledged “freedom of religion” in his 1801 Inaugural speech and addressed the “wall of separation between Church & State” in his 1802 letter to the Danbury Baptists. In 1817 Agent Granger described the Seneca as starving. The tribe split in 1819, Chief Red Jacket’s pagans and another’s Christians. Red Jacket died on January 20, 1830, a factional leader who mostly survived Andrew Jackson’s Indian removal policies and America’s Second Great religious Awakening. « Home for the Holidays!